(left) "Bad Girl" Jaime King, and (right) Seann William Scott and Chow Yun-Fat act like they're having fun. The Skinny: Ho hum. Chow Yun-Fat's inimitable charm flashes through on more than one occasion, but this comic book adaptation is pure Hollywood assembly-line product. Kids might dig the flashy wirework, and those seeking brain-dead fun might feel partially satisfied. But let's face it: this movie is simply not good at all. Chow Yun-Fat has long shown himself to be one of Hong Kong's most versatile actors, and no matter what your cinema jones is, he's probably given a performance that has satisfied it. But, what do people really want from Chow Yun-Fat? Do they want the supercool charisma of Mark in A Better Tomorrow? Or the charismatic wackiness of the God of Gamblers films? Is it the powerful intensity of Prison on Fire that people are looking for? Do people want him to redefine the role of Asian males in American commercial cinema? Or is it that people simply want to see the guy? If that latter question causes you to raise your hand, then Bulletproof Monk is for you. However, anyone who answered "yes" to the other questions should simply rent one of Chow's older Hong Kong classics. Chow plays the Monk With No Name, a Tibetan super monk who gave up his name to safeguard an ancient scroll which will grant its reader the power to remake the world in his/her image. Never mind that such a plot device is without any historical or mythological basisit exists simply as a Macguffin which gets the plot (or what little plot happens to exist) rolling. In the opening sequence, the Monk defends the scroll from a band of marauding Nazis circa 1943. He manages to escape, leaving head Nazi Strucker (an overacting Karel Roden) screaming after the Monk like James T. Kirk in Star Trek 2: The Wrath of Khan. Flash-forward sixty years and the Monk is still on the run from Strucker's people, except now he's wandering around modern cityscapes saving people from minor inconveniences. Fortuitously, he runs into streetwise pickpocket Kar (Seann William Scott of American Pie fame), which causes the Monk to do a double take. Despite Kar's lack of any true discipline, the Monk senses that Kar could be the "chosen one," i.e. the next guardian of the mystic scroll. However, first Kar has to fulfill three prophecies, which are mystical mumbo-jumbo conditions which probably don't translate into English the way Bulletproof Monk purports. Nevertheless, the Monk takes Kar under his wing, and attempts to teach the kid some groovy wire-fu powers, as well as a helpful handful of pseudo-Eastern philosophy. 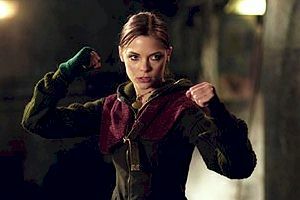 Plus there's fighting, a love interest (Jaime King as "Bad Girl"), and more cloying plot devices than you can imagine. 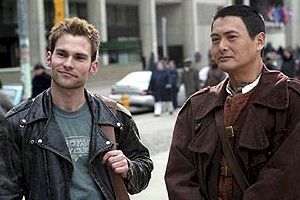 Bulletproof Monk is based on a comic book, which partially accounts for the lightweight storyline and simplistic narrative. The rest of the blame falls on the filmmakers, who never fleshed out the premise into anything remotely resembling a substantial story. The pacing of Bulletproof Monk is by-the-numbers and annoyingly straightforward. First, we meet the Monk. Then, the Monk meets Kar. Then, the bad guys show up. More uninspired exposition occurs, bad guys repeatedly appear without any real provocation, and ninety minutes later everything concludes in grand wire-fu fashion. Nothing new or exciting occurs, and whatever drama the film creates is manufactured and without any emotional connection. When the Monk begins to doubt his initial decision to bring Kar into his world, the moment seems to exist simply to create some minor inner conflict. Like everything else, that conflict is resolved quickly, and just in time for the bad guys to show up unannounced once more. It's as exciting as a do-it-yourself screenwriting manual. Without any help from the narrative, the actors and the action must make up for everything. There's partial success there, as Chow Yun-Fat shows the charm and screen presence that make him a world class movie star. His sly comic timing and inherent coolness will likely be obvious to even the uninitiated, and there are more than a few sequences which succeed simply because Chow is on the screen. However, everything else is severly lacking. Seann William Scott is a likable enough screen presence, but he's far too lightweight an actor to make his character anything more than throwaway amusing. Jaime King is cute but uninteresting, and the bad guys (Karel Roden and Victoria Smurfit) sneer and glower like extras in an Indiana Jones movie. The action is perfunctory and full of quick-cuts and too-obvious stunt doubles. Kids might find the obvious wire-enhanced action exciting, but otherwise it seems to exist simply because modern Matrix-influenced action flimmaking requires it. Director Paul Hunter is a music video director, which is fitting considering the overdone cutting and blocky narrative pacing. What's ironic though, is that the music is egregiously out of place. Shouldn't music video directors be hired for their ability to match audio and image? Unfortunately, Hunter has composer Eric Serra crowd every scene with extra-loud music which is sometimes waaaay out of place. Add that to his paint-by-numbers direction, and you have the recipe for cinematic mediocrity. Did John Woowho's listed as producerever visit the set? Then again, considering Woo's recent output, it's doubtful he could have done anything to make Bulletproof Monk any better than it is.